Raki or rakı (/ r ɑː ˈ k iː /, / r ɑː ˈ k uː /, / r ɑː ˈ k ɜːr /, Turkish pronunciation: ) is an unsweetened, often anise-flavoured, alcoholic drink that is popular in Turkey, Turkic …... ”The best accompaniment to Raki is good conversation.”-Mustafa Kemal Ataturk. Raki, the unofficial national drink of Turkey is more than a glass of alcohol, it’s an experience in itself. VIC : WARNING : Under the Liquor Control Reform Act 1998 it is an offence to supply alcohol to a person under the age of 18 years [Penalty exceeds $18,000], for a person under the age of 18 years to purchase or receive liquor [Penalty exceeds $700] NSW : It is against the law to sell or supply alcohol to, or to obtain alcohol on behalf of, a... Turkey- Yeni Raki is produced by twice distilling with suma that has been mixed with ethyl alcohol and aniseed. Raki is the unofficial 'national drink' and it is traditionally drunk mixed with water; the dilution causes this alcoholic drink to turn a milky-white colour. A grape and aniseed base Turkish specialty, that tastes more-or-less like a strong ouzo. Followers of this liqueur swear otherwise, claiming it to possess somewhat different properties than ouzo, and are happy to pay the slightly higher price it demands. 45% Alc./Vol.... Users have rated this product 4.5 out of 5 stars. Anise Liqueurs constitute a sub-category of the broader liqueur family. Anise (Pimpinella anisum) is a licorice Turkey, on the Anatolian Peninsula between the Mediterranean and Black seas, grows more g Stores and prices for 'Mey Icki Yeni Raki'. Gail Mooney / CORBIS. Originally developed as an alternative to absinthe, raki — its still potent cousin — is popular in Greece, Bosnia and other Balkan countries and is called the national drink of Turkey. Turkey- Yeni Raki is produced by twice distilling with suma that has been mixed with ethyl alcohol and aniseed. Raki is the unofficial 'national drink' and it is traditionally drunk mixed with water; the dilution causes this alcoholic drink to turn a milky-white colour. Yeni Raki. 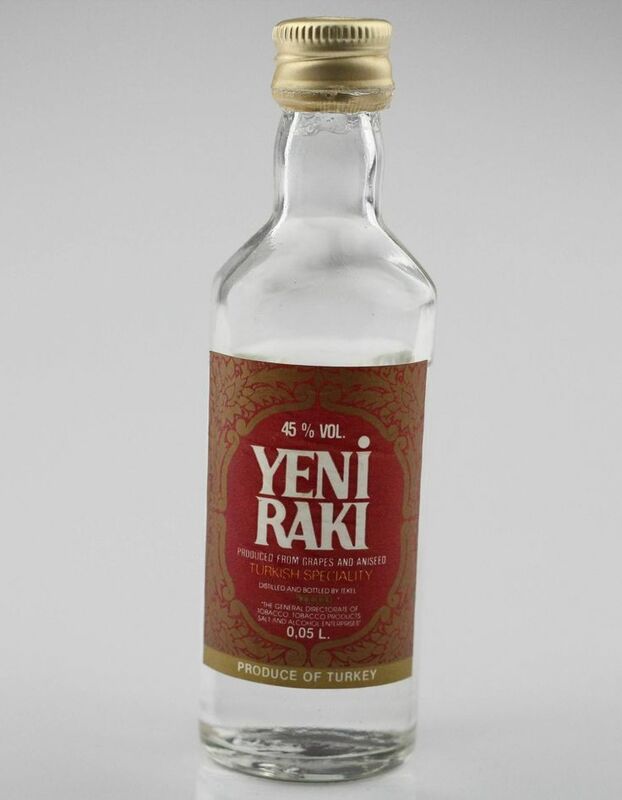 Produced since 1937, Yeni Raki is made from the finest Anatolian grapes and aniseed. A Turkish legend, Raki has been made and enjoyed in Turkey and surrounding countries for over 500 years, with the first references appearing in literature in 1510.